12.6 million, or 10.8% of all American women aged 20 years or older have diabetes. Most of these women do not know or have the support of another woman who is living with diabetes. During National Diabetes Month, Ayogo and DiabetesSisters are joining forces to make it easier for women with diabetes to find and connect with one another in a unique and innovative way. 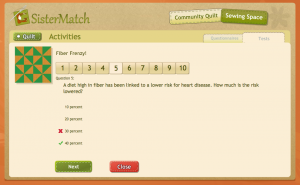 SisterMatch is the first matchmaking social game of its kind. By blending a comprehensive matchmaking algorithm with the fun and engagement of social games, SisterMatch aims to bring like-minded women together for support, mentorship and knowledge exchange in a state-of-the-art fashion. 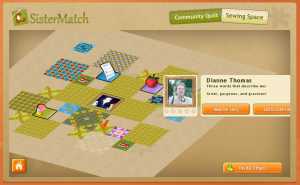 SisterMatch centers around women earning quilt blocks by participating in knowledge tests and personality quizzes – each woman’s unique quilt is then woven into the intricate Community Quilt. SisterMatch’s innovation lies in its matchmaking algorithm, which gathers information about members’ attitudes, personalities and preferences, and then delivers each Sister her best “SisterMatches”. Using this matchmaking process, women with diabetes will be able to build a list of compatible peer support friends, and begin new friendships while also learning helpful information about healthy living in a fun, interactive way. By harnessing the power of game and social support, SisterMatch provide a fun and engaging tool to help women to live with their diabetes. Ayogo reimagined SisterMatch in partnership with Diabetes Sisters with the objective of helping women with diabetes find well-matched allies as they make their journey toward thriving with diabetes.